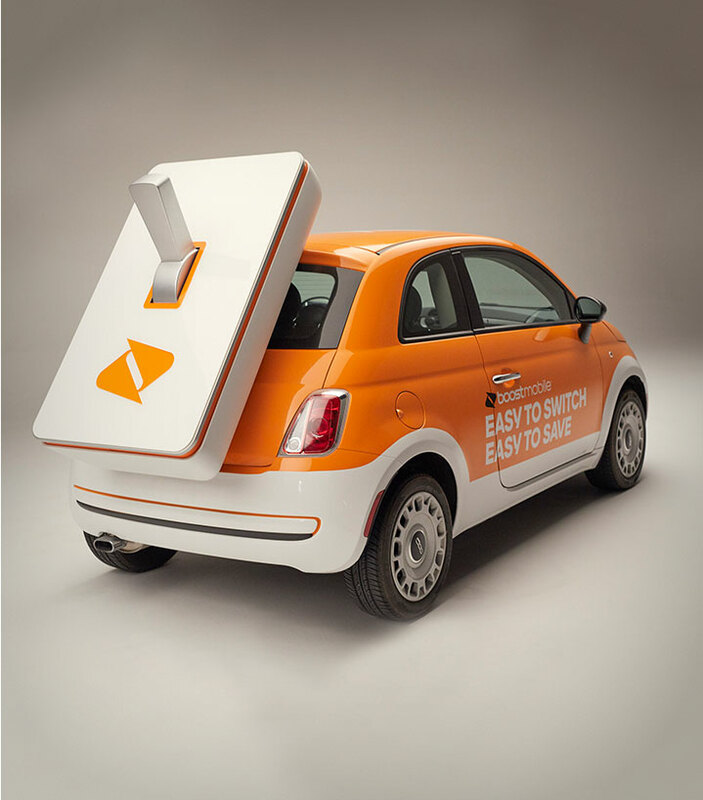 While the mobile wars raged, Boost sat on the side-line for a few years, losing market share, and customers, before re-emerging. Fueled by a fresh challenge, we dug deep for a fresh foothold, and uncovered a powerful truth; Despite the gains of our competition - customers weren’t happy with the new pre-paid marketplace and all its negative mud-slinging. In our research, one thing kept surfacing across all user demographics and psychographics… mobile customers are jaded, cynical about their service. But even more, they hated how difficult it was to switch carriers. The have a love for their phone, but a hate for their carrier, and genuinely feel that there is no way out. 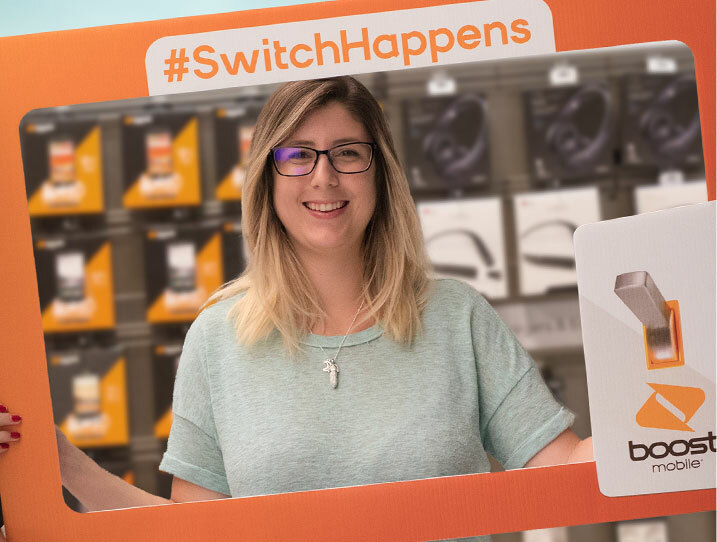 SCS took insight and brought a simple and easy to understand ray of light to the category in the form of two Boost representatives, empathetic to customers’ pain, and an iconic Switch designed to help customers get over the barrier of switching to a better solution. Together the combination highlights how easy it is to find a better solution and to save money. 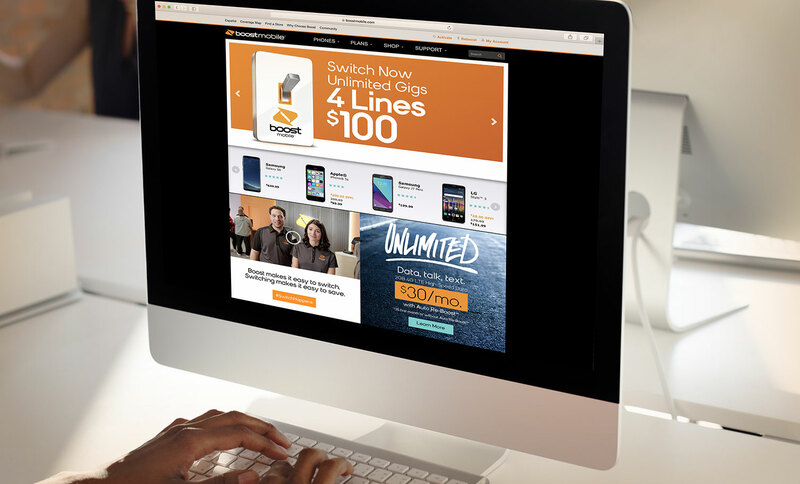 Everyday customers enter Boost a bit on the edge due to their current carrier relationship. They’re angry, or overly forgiving, resigned, or confused. But the one thing they all have in common. They could use a switch. Grant and Gina are empathetic voices of reason, and a very simple solution. Not out to hurt anyone, or tell customers that what they are doing is wrong, but they are there to help. 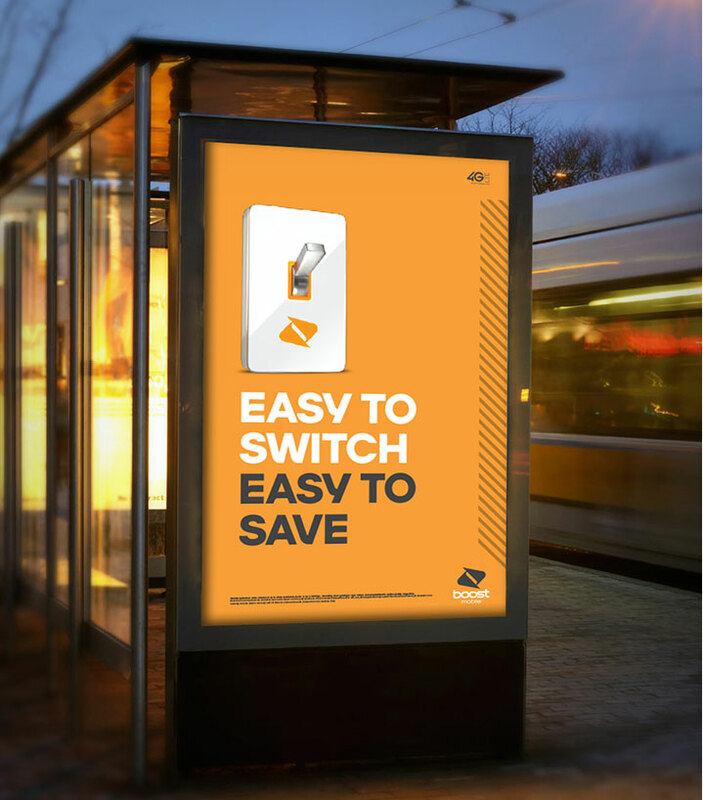 The switch becomes an easy, memorable, and iconic reference point for digital and social, helping continuously cue how simple it is to get better service and save money. 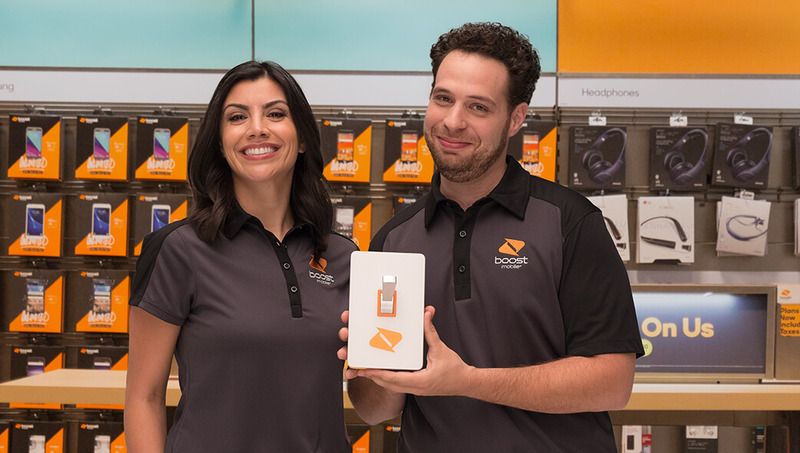 Grant, Gina, and their money-saving switch also make an appearance in social channels, reminding customers how easy it is to let Boost fix all their mobile woes. 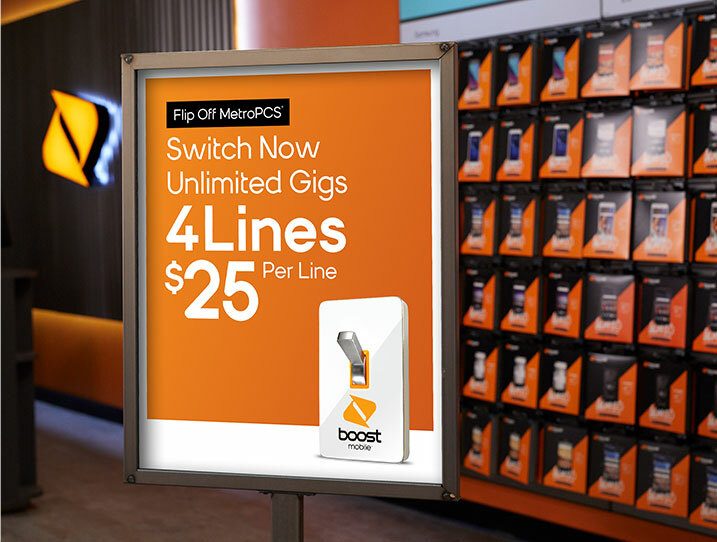 The Hispanic market is an important segment of Boost Mobile’s customer base, so it was vital to have a campaign that would translate well to Spanish language and Hispanic culture. Since Grant and Gina can’t be in every store, we developed a transportable and iconic device to have a bit more fun supporting the regular POS material. An active switch with 20 unique sound effects in both English and Spanish. 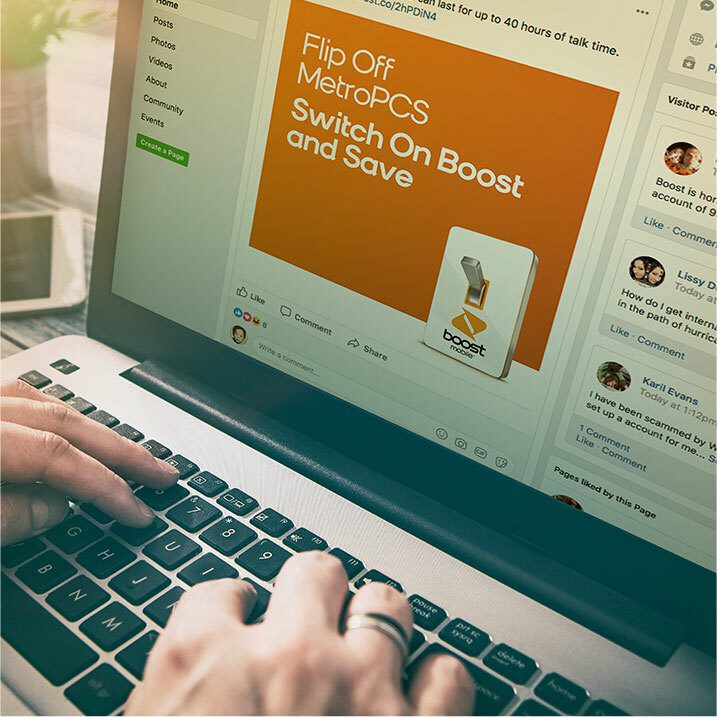 Project Switch made an immediate and lasting impact for Boost Mobile. The campaign resonated with new audiences, and new subscribers began pouring in. 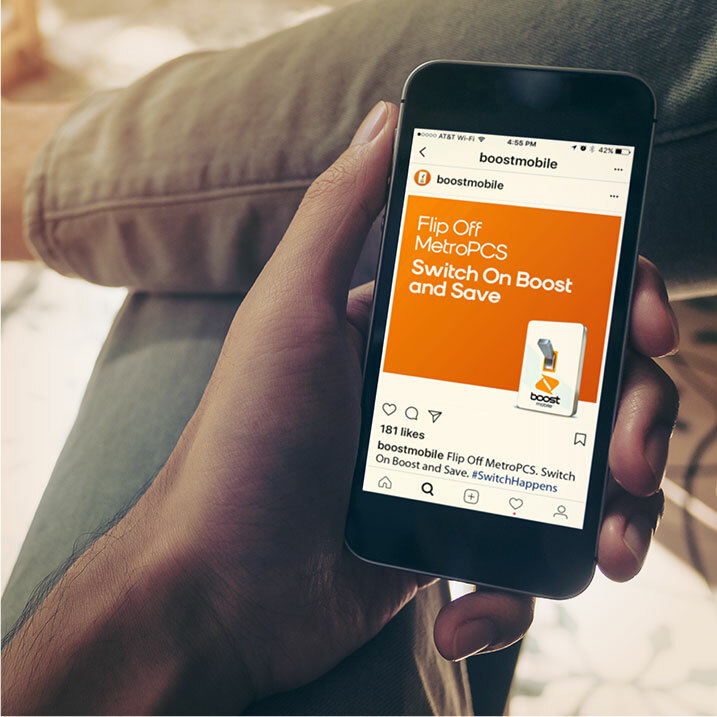 SCS helped Boost move the needle in brand perception with gains in brand relevance, likelihood to recommend, and perception of Boost Mobile as a fast and reliable network with good value in unlimited plans.